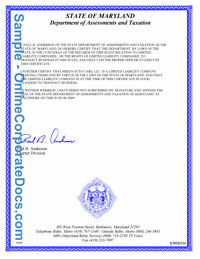 Maryland Good Standing Certificate | Online Corporate Docs, Inc. The Maryland Certificate of Status (Also referred to as the Maryland Good Standing Certificate or Maryland Certificate of Existence) is an official document issued by the Maryland Department of Assessments and Taxation that certifies that the legal entity is registered with the State of Maryland and is compliance with all State required formalities. Upon application to the Maryland Department of Assessments and Taxation a Certificate of Status will be granted to any domestic or foreign profit and nonprofit corporation, limited liability company that was duly formed or registered within the State of Maryland and is in good standing. See to the left is an image of Certificate of Corporate Status "Maryland Good Standing"
Same day delivery orders must be received before 1pm EST. A printable Adobe PDF of the document will me emailed to you next business day and a printed copy will be mailed to you in 3-5 business days. Expiration, CVV2 January February March April May June July August September Octover November December - 2019202020212022202320242025202620272028 ? Please press Buy Now only once, Processing may take up to 30 seconds.